Migori governor Zachary Okoth Obado. Information Cabinet Secretary Joe Mucheru has appointed Jared Peter Odoyo Kwaga -- one of the key suspects in a Sh2 billion graft probe targeting Migori Governor Okoth Obado -- to the Kenya Institute of Mass Communication (KIMC) board. Mr Kwaga's Pasha Centre is among nearly 40 others spread across the country and the only one in Migori. When the anti-graft watchdog sought court assistance to trace and freeze assets believed to be part of Mr Obado's fraud scheme, it listed Mr Kwaga as a first respondent. The EACC adds that Mr Kwaga wired some of the graft proceeds to Mr Obado's daughter Susan through a Sh1.9 million bank transfer in December 2014. Mr Kwaga's wife Christine Akinyi Ochola, brothers Patroba Ochanda Otieno and Joram Opala Otieno and his mother Penina Auma are also part of the scheme, as per the EACC's court filings. While the Migori-based businessman has not been found guilty of fraud, his appointment is certain to raise debate at a time the war on graft tops President Uhuru Kenyatta'a agenda - alongside healthcare, housing, manufacturing and food security. EACC's documents before court show that Mr Kwaga's companies received Sh1.6 billion in dubious contracts that the watchdog is investigating, after which substantial amounts were wired to Mr Obado. Another 37 pieces of land in Migori and its environs were acquired with funds believed to have been stolen, and 22 of them are registered in Mr Kwaga's name. 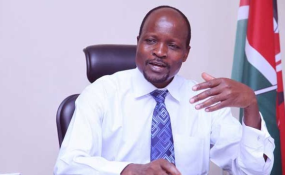 According to the EACC, Governor Obado operated an intricate web of companies and accomplices that saw county funds transferred to his children's accounts in Australia, Hong Kong and China. But EACC spokesperson Yasin Amaro said Mr Kwaga's appointment must have been an oversight because any individual under such investigations cannot be appointed to public office as per law. "If someone is under investigation they cannot be appointed to public office until investigations are completed. According to Chapter Six of the Constitution, it is a requirement. "That's the reason people first come for clearance from EACC. Once we check out the facts on the ground on Monday, we will review everything and see what action to take," Mr Amaro said. Meanwhile, the fruits of the March 9 "handshake" continue to be felt in Nyanza following the recent parastatals appointments that has seen close allies of ODM party leader Raila Odinga land plum positions. The move comes in the wake of Mr Kenyatta's assertion that the country will no longer stand the "winner-take-all" mentality of political contests while giving his commitment to ensure that even those in the opposition are accommodated in government.